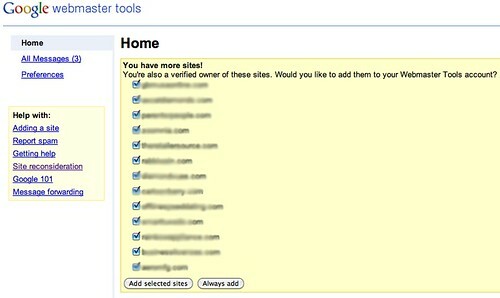 If you login to your Google Webmaster Tools account, you may be prompted to add more sites to your account. You're also a verified owner of these sites. Would you like to add them to your Webmaster Tools account? I should note that many of these were the non-www equivalent of sites I have already added to my Google Webmaster Tools sites list. It is best practice to add both the www and non www.